Lauglovatnet, one of the reference lakes with early morning fog. Photo Torbjørn Ekrem CC-BY. What will happen with the eDNA of lake fauna when much of the animal life is eradicated? We suspect that it will increase as the dead animals dissolve and then decrease to a level below that before rotenone treatment, but we don't know for sure. 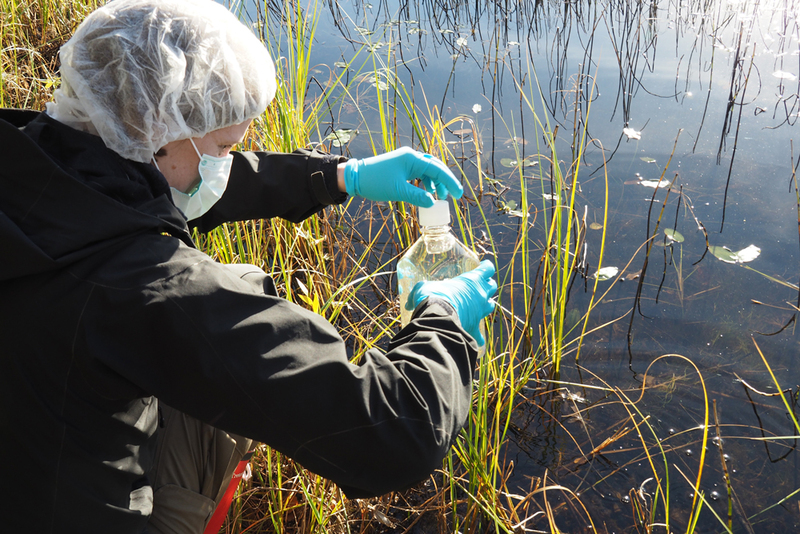 Previous studies also show that macroinvertebrates in lakes are less susceptible to the rotenone poison than fauna in running water. Thus, we do expect a many species and perhaps species groups to do survive the treatment. What will happen to these populations when the benthic community is altered and all fish is gone? We will follow up with eDNA sampling through EBAI and compare results with those of traditional benthic kick-sampling at the exact same sites. This week, a journalist and photographer from NRK - the national public broadcaster - joined us in the field. Their report can be viewed here: "Ny metode for vannovervåkning". Gaute Kjærstad not quite believing that this is sufficient to tell who lives in Lauglovatnet. Photo Torbjørn Ekrem CC-BY. 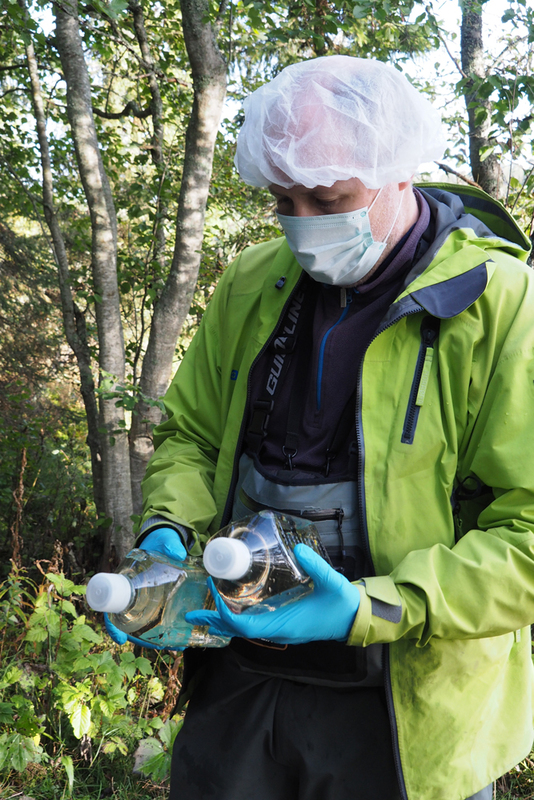 Aina Mærk Aspaas sampling water from Theisendammen. Photo Torbjørn Ekrem CC-BY. 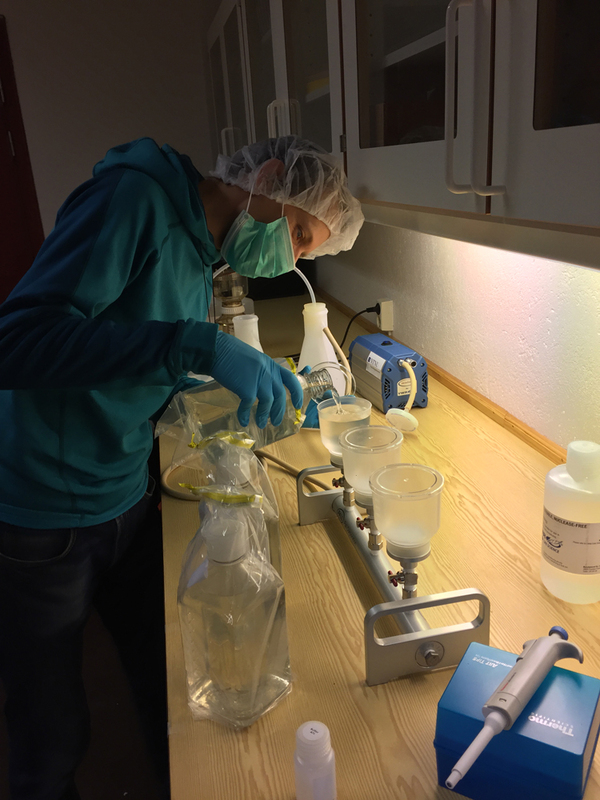 Markus Majaneva filtering water samples in the lab at NTNU University Museum, Department of Natural History. Photo Torbjørn Ekrem CC-BY.